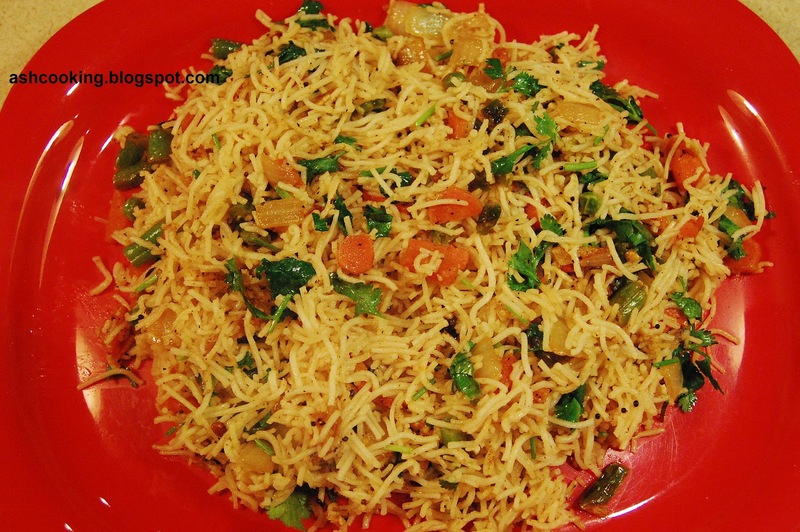 Sevai is one kind of rice noodles, very popular in southern part of India. It is cooked in different flavours like, lemon, tamarind, cashew nuts, and curd. 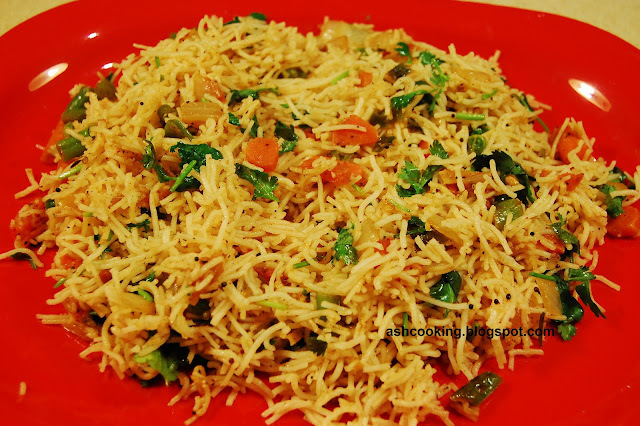 It serves as a fulfilling breakfast or tiffin that can be made in few minutes. Since I complete my breakfast with biscuits and 1 glass of juice or soya milk, the luxury of having sevai in breakfast is out of option. So I chose it as dinner yesterday and it was really fulsome. 1) Instant rice sevai is like noodles, very soft in texture. So you don't need to boil it. Simply boil water and then pour that into the bowl of sevai. Keep it covered for 3-5 minutes till rice sevai is tender. Drain the water and set it aside. 2) In a non-stick skillet, heat oil and when oil turns piping hot, add in the ingredients for sautéing and let them sputter. 3) Add ginger, carrot, beans, onion, tomatoes, and peas one after another in that order and shallow fry. Toss in the green chilies. Mix in salt and black pepper powder. Cook on medium flame, stirring occasionally till the vegetables soften. About this time you may give a splash of water to keep the moist in. 4) Now add the sevai and toss them all together. Squeeze lemon juice on top. 5) Garnish with coriander leaves. Serve hot.